1 Follow the hoses back from the water softener to where the hoses join the copper pipes. 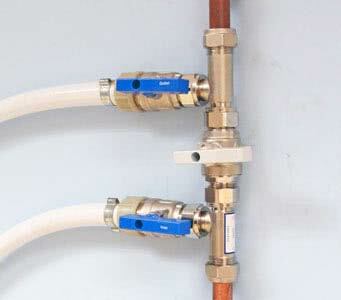 Here you will find 3 isolation valves, known collectively as the bypass set. They may look like the SOFTENING pictures below. 2 Turn all three ¼ turn handles so that they look like the handles shown in the BYPASSED photos. They should be easy to turn without resitance. 3 When all three handles are turned in this way your machine will be isolated from the water supply and ordinary hard water will continue to flow to the property. 4 You may then turn off the 3 watt electric supply to your machine to completely turn off your water softener. In this position all the water is routed into and out of the Water Softener. The inlet and outlet isolation valves are open and the bypass valve is closed. In this position the water is prevented from going into and out of the Water Softener but it is allowed to go to the rest of the house. 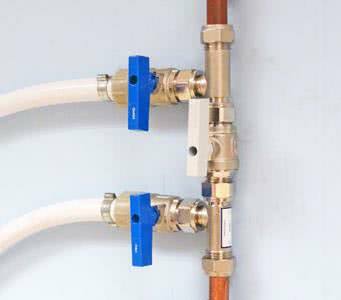 The inlet and outlet isolation valves are closed and the bypass valve is open.